A lot can change in a year. At this time last year, the New York Rangers needed a win on the last day of the regular season and a loss from the Carolina Hurricanes just to qualify for the playoffs as the 8th seed in the Eastern Conference. This year, a Rangers loss on the last day of the regular season meant that they couldn’t clinch the Presidents’ Trophy for having the best record in the NHL. In between those bookends, the 2011-12 regular season was nothing short of a magical ride for an organization that hasn’t had too many of them in their history. The buzz for this season started on July 2nd, 2011, when Rangers’ President and General Manager Glen Sather announced that the Rangers had signed free agent center Brad Richards to a 9 year/$60 million contract. With a majority of the roster from 2010-11 returning, the addition of Richards gave the belief that better things were on the horizon. In addition to the Richards signing, the other major announcement of the off-season came on the eve of training camp, when Ryan Callahan was named the 26th captain in franchise history. The move made perfect sense as Callahan, a 4th round draft pick of the Rangers in the 2004 draft, embodies everything that the Rangers’ style of play is all about. The Rangers’ regular season began with a seven-game road trip that included two games in Europe and four games in Western Canada while Madison Square Garden was undergoing the first of a three part transformation. After going 0-2-1 in their first three games, the Rangers got on track thanks to the first of many spectacular performances from Henrik Lundqvist throughout the season. Playing against the defending Western Conference Champion Vancouver Canucks, the Rangers were outshot 40-19, yet came away with a 4-0 win as Lundqvist made save after save against the Canucks’ high-scoring offense. The game was just a glimpse into the year that Lundqvist was about to have. The Rangers’ MVP for the 6th consecutive season, a franchise record, Lundqvist’s game reached new heights in 2011-12. The Rangers’ goaltender established career bests in wins (39), goals against average (1.97), and save percentage (.930), and will undoubtedly be a nominee for the Vezina Trophy. After returning home, the Rangers used a six-game homestand to spark a seven-game winning streak that extended into mid-November. The Rangers finished the month with a 9-2-0 record, and also saw the emergence of two call-ups during the month, Carl Hagelin and John Mitchell. After their call-up, both players remained as regulars in the lineup for the remainder of the season. After making his NHL debut, Hagelin, the 23-year-old Swede, worked his way onto the Rangers’ number one line. Near the end of the month, Hagelin recorded his 1st NHL goal in a 2-0 win over the Philadelphia Flyers, and set the stage for a month-long battle that was broadcasted on HBO. 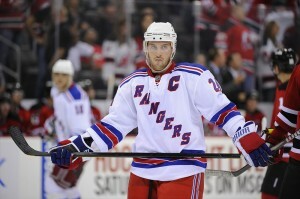 In December, the Rangers took part in HBO’s ’24/7′ series that led up to the Winter Classic against the Flyers. Despite the added distraction, the Rangers continued to win, and some of their most memorable wins of the season took place in front of the cameras. The first one was a win in Phoenix, where Brad Richards scored the game winning goal with 0.1 seconds remaining in regulation. Another memorable win was a victory over the Flyers on December 23rd put the Rangers in 1st place in the Atlantic Division, a spot they wouldn’t relinquish for the rest of the season. It also was a great set-up for the game in Philadelphia a week and a half later. Despite being down 2-0 midway through the second-period, the Rangers tied it up on a pair of goals by Mike Rupp, and took the lead on another clutch goal by Richards, one of many he scored this season. To put the game away, Lundqvist stopped the Flyers’ Daniel Briere on a penalty shot with twenty seconds remaining. As the calendar turned to 2012, the Rangers continued to grind out wins, and many came in the five minute overtime period. In January, two of those overtime wins came from Marian Gaborik, who had a renaissance year in 2011-12. After a great first year in New York, Gaborik struggled in 2010-11, as injuries caused his goal output to drop. Even though he didn’t immediately click with Richards to start the year, Gaborik consistently produced throughout the year, finishing the season with 41 goals, 3rd in the NHL behind Steven Stamkos and Evgeni Malkin, as well as scoring a hat trick in the 2012 All-Star Game and winning MVP honors along the way. As well as the Rangers were playing throughout the first four months, the month of February revolved around trade rumors, mainly the possibility of Rick Nash coming to Broadway. Yet for all of the talk, and Sather’s negotiations with the Blue Jackets ended with no trade being made, and other than a trade for John Scott right before the deadline, the Rangers decided to go for the Cup with the same roster that they had all season. Even as the Rangers hit their first extended rough patch of the season in early March, the confidence inside the dressing room never wavered, and they finished the season as Atlantic Division Champions and the #1 seed in the Eastern Conference for the first time in eighteen years. In the history of the 86-year old franchise, the 51 wins was the 2nd most in team history, the 109 points was tied for 2nd, and their .665 winning percentage was 5th. For a team that scratched to enter the playoffs a year ago, they exceeded everybody’s expectations. However, what makes this team special is that if you ask them about their season, they haven’t met any of their expectations yet. As of today, their “new” 2011-12 record is 0-0. Their regular season record is irrelevant going forward, but the memories of one of the greatest regular seasons in team history will remain.